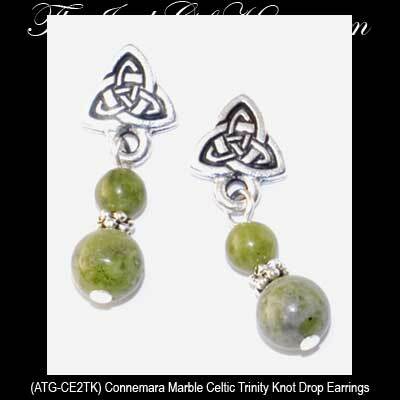 Celtic earrings feature Connemara marble beads along with the Trinity knot design. Connemara marble is the only naturally green marble in the world, fittingly it is only found in Ireland. These silver plated over pewter Celtic earrings feature the Trinity knot along with Connemara marble beads. The Connemara marble earrings are a stud style with butterfly backs that measure 3/8" wide by 1" tall to the bottom of the dangling beads. The Irish earrings are made in Kilkenny, Ireland by All That Glisters and they are gift boxed with Celtic knot and Connemara marble history cards, complements of The Irish Gift House. All That Glisters jewelry is made in Kilkenny, Ireland. Celtic necklace with a Connemara marble bead features the Trinity knot.